"I am so sorry for your loss. Take comfort in knowing that..."
"Sincere condolences to the family of Edith Lucille Chandler..."
SOUTH PORTLAND - Edith Lucille Chandler, 98, of Palm City, Fla, died Monday, Nov. 19, in South Portland, Maine. She was born March 4, 1920 in Hagerstown, Md., to the late Adam Victor Blomberg and May Caroline Blomberg (Ernst). She married Joseph William Chandler on Oct. 4, 1941. He predeceased her in 2004. Her older sister Doris also predeceased her. She leaves Wade J. Chandler, Colorado, David W. Chandler (Sally), Maine, and Karl V. Chandler (Jyl), Pennsylvania, plus seven grandchildren and ten great-grandchildren. Chandler was a long-time physical education instructor, coach, and referee. She graduated in 1962 from West Chester State Teacher's College (now West Chester University), West Chester, PA. After retirement she was a Certified Athletic Trainer and worked with high school athletes in Florida. Chandler lived in Newtown Square, Pa. from 1959-2014, and in Palm City, Fla., from 1987. 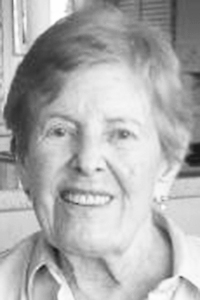 She was a competitive golfer and long time member of Overbrook Country Club and Philadelphia Cricket Club, in Philadelphia, Pa., and Harbour Ridge Yacht & Country Club, Palm City, Fla..
A spring internment service will be held at Arlington National Cemetery, Arlington, Virginia where she will be buried next to her husband Joseph. Dennett, Craig & Pate Funeral Home and Cremation, 365 Main St., Saco are entrusted with her arrangements.